Providing the perfect storm of rich media and active learning tools. The Atmosphere: An Introduction to Meteorology remains the definitive introductory meteorology text, reinforcing basic concepts with everyday, easy-to-grasp examples. 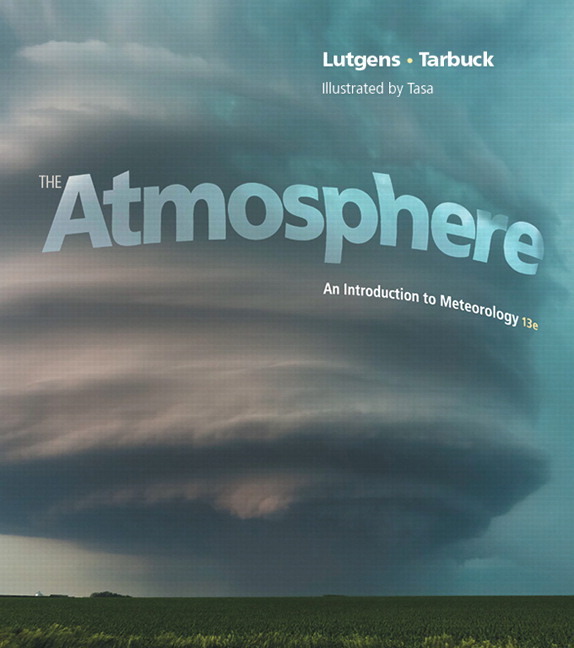 This revision retains the hallmark features professors have come to expect from Tarbuck and Lutgens: a friendly, largely non-technical narrative, timely coverage of recent atmospheric events, and carefully crafted artwork by leading science illustrator Dennis Tasa. The Thirteenth Edition now incorporates a new active-learning approach, integrated mobile media, and MasteringMeteorology, the most complete, easy-to-use, engaging tutorial and assessment tool available.This edition also extends its coverage of global climate change with dedicated climate change features in each chapter, coverage of the IPCC 5th Assessment report, and an inquiry-based approach in updated Student Sometimes Ask features with interesting facts that strengthen the connection between students and the content. MasteringMeteorology is an online homework, tutorial, and assessment product designed to improve results by helping students quickly master concepts. Students benefit from self-paced activities that feature immediate wrong-answer feedback and hints that emulate the office-hour experience to help keep students on track. With a wide range of interactive, engaging, and assignable activities, students are encouraged to actively learn and retain tough course concepts. MasteringMeteorology is an online homework, tutorial, and assessment program designed to work with The Atmosphere: An Introduction to Meteorology, Thirteenth Editionto engage students and improve results by quickly mastering meteorology concepts. Students benefit from self-paced coaching activities that feature immediate specific wrong-answer feedback and hints that emulate the office-hour experience to help keep students on track. With a wide range of interactive, engaging, and assignable activities, students are encouraged to actively learn, master, and retain tough course concepts. NEW! SmartFigures are brief, narrated video lessons thatexamine and explain concepts illustrated by key figures within the text. Students access SmartFigures on their mobile devices by scanning Quick Response (QR) codes next to key figures. These media are also available in the Study Area of MasteringMeteorology and can also be assigned by teachers with quizzes. Integrated Mobile Media. QR links to videos and geoscience animations are integrated throughout the chapters, giving students just-in-time access to animations of key physical processes and videos of real-world case studies and data visualizations. These media are also available in the Study Area of MasteringMeteorology. Including SmartFigures, there are over 150 mobile media items linked to the 13th edition. MapMaster presents exciting place name and GIS-inspired layered thematic interactive maps at world and regional scales for students to test and enhance their geographic literacy and spatial reasoning skills, and explore the modern geographer’s tools. The interactive maps now include additional maps from human/cultural and physical geography, complete with hints and wrong answer feedback, providing more compelling interactive mapping media and assessments across the chapters. NEW! Videos from sources such as the BBC, Financial Times, NASA, NOAA and FEMA are now included in addition to the videos from Television for the Environment’s Life and Earth Report in MasteringMeteorology. Encounter Meteorology Activities provide rich, interactive explorations of meteorology concepts, using the dynamic features of Google Earth™ to visualize and explore Earth’s physical environment and its atmospheric phenomena. Carbone’s Exercises for Weather & Climate, Ninth Edition presents data-rich and hands on explorations of meteorlogical concepts for lab sections with problem solving, simulations, and guided thinking. GEODe Activities, provide an interactive visual walkthrough of each chapter’s core content through animation, videos, illustrations, photographs, and narration. Created by Dennis Tasa, activities include assessment questions to test those concepts with hints and wrong-answer feedback. NEW! Dynamic Study Modules personalize each student’s learning experience. Created to allow students to acquire knowledge on their own and be better prepared for class discussions and assessments, this mobile app is available for iOS and Android devices. In the News RSS Feeds and MySearchLab give students access to hundreds of constantly updated current articles for additional enrichment or research projects. UPDATED! Focus on Concepts learning goals are listed in the chapter-opening spreads and correlate to Concept Check and GIST questions to help students focus on and prioritize the learning goals for each chapter. UPDATED! Concept Check questions are integrated throughout each chapter. These serve as conceptual speed bumps, asking students to assess their understanding as they are reading. NEW! End-of-chapter feature, Concepts in Review, coordinates with the Focus on Concepts at the beginning of the chapter and with the numbered chapter sections. It is a readable, concise overview of key points and terms that often includes photos, diagrams, and questions to help students focus on important ideas and test their understanding of key concepts. UPDATED! Give It Some Thought (GIST) questions are found at the end of each chapter and ask students to use higher-level thinking. They often involve chapter visuals, which help students apply and synthesize entire chapter concepts. Eye On The Atmosphere features engage students with active learning tasks, asking them to observe, perform critical visual analysis, and forecast–core behavioral goals of this course. The Students Sometimes Ask... feature adds relevance to text discussions with high-interest questions and answers distributed throughout the chapter and identified by a large question mark. Ample pedagogy includes chapter summaries, key terms, checklists, review questions, and application problems with a quantitative orientation. A flexible organization allows instructors to rearrange or omit chapters without losing continuity. Concepts in Review is a new end-of-chapter feature coordinated with the Focus on Concepts at the beginning of the chapter and with the numbered sections within the chapter. It is a readable and concise overview of key points that includes photos, diagrams, and questions that also help students focus on important ideas and test their understanding of key concepts. NEW! What’s Your Forecast? feature highlights the relevance of meteorology in today’s world by allowing students to make predictions based on real-world data. Topics include using maps to identify precipitation patterns (Chapter 5), constructing and analyzing a surface weather map (Chapter 9), and predicting the probability of severe storm occurrences (Chapter 10). Critical thinking skills are reinforced as students apply concepts presented in the chapter. An unparalleled visual program. In addition to the large number of new, high-quality photos and satellite images—many of which highlight recent weather events—dozens of figures are new or have been redrawn by renowned geoscience illustrator, Dennis Tasa. Maps and diagrams are frequently paired with photographs for greater effectiveness. Further, several new tables summarize key phenomena, and many new and revised figures have additional labels that narrate the process being illustrated to guide students as they examine the figures, resulting in a visual program that is clear and easy to understand. Reference maps on global weather extremes and Earth satellite imagery are now found inside the front and back cover of the book. A Cloud Chart insert at the end of the book encourages students to make observations and forecasts in the real world. Integrated coverage of the findings and data of the IPCC 5th Assessment Report data. More coverage on past climates, natural variability. NEW and UPDATED Special Interest boxes better emphasize Severe & Hazardous Weather and other specialized content.